Connect Assist’s CEO Patrick Nash hosted the tour of the contact centre after he had cut the cake to celebrate the company’s anniversary. Since the establishment of Contact Assist, supported by a number of grants from the Welsh Government, the company is committed to providing meaningful employment in the South Wales Valleys, with half of our workforce joining after a period of unemployment. 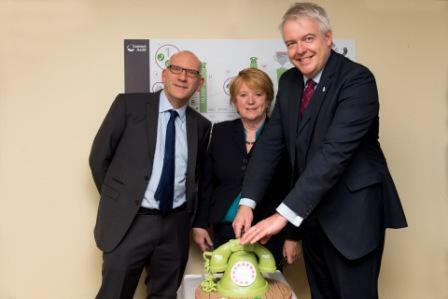 First Minister Carwyn Jones said: “I was delighted to join Connect Assist to celebrate their ninth anniversary and meet staff who provide the key helpline and digital advice services to the public and third sectors. Patrick Nash commented that The Welsh Government had been a fantastic support to Contact Assist in the form of grants and assistance, and helped the Company to create over 100 jobs for people in our last nine years. The Welsh Government recently provided a £150,000 grant from the Wales Economic Growth Fund, which brings the total support since March 2012 of £373,000. We have also received £10,000 for skills support from the Department for Education and Skills. Be the first to comment on "Connect Assist celebrate Ninth Birthday since launch of Contact Centre"